I am not in my salad days being a woman of a certain age with almost solid white hair. My wonderful husband calls me a platinum blond! “Salad days” is a Shakespearean expression referring to youthfulness, inexperience, and the enthusiasm that accompanies innocence. I am in the salad days of this blogging experience and the recipes this week are salads. We are in a heatwave defined by three consecutive days of 90 plus temperatures and, I believe, a certain level of humidity. In this type of heat it is best to not heat up the kitchen with a lot of cooking and the cold salads are refreshing as well. So first of all there is the standard cucumber-onion salad of my youth. Mom would slice up a cucumber and an onion, put it in a bowl, and cover with a mixture of water, sugar, and white vinegar. She may have added salt and pepper but I do not really remember. This bowl would be placed on the kitchen table while supper was prepared and I would sneak nibbles until supper. I believe my siblings also would pick at the cucumbers as well. I have looked at a number of recipes for this and most, if not all, call for oil and heating the concoction before pouring on the cucumber-onion combination. My mom never used oil nor do I remember her heating anything. So even though I have looked at those recipes to get an idea of the proportions I never add the oil. My basic recipe is equal parts sugar, water, and white vinegar. I add dill as well although this time I added sliced mini red peppers to mimic a recipe I found in Food Network Magazine. 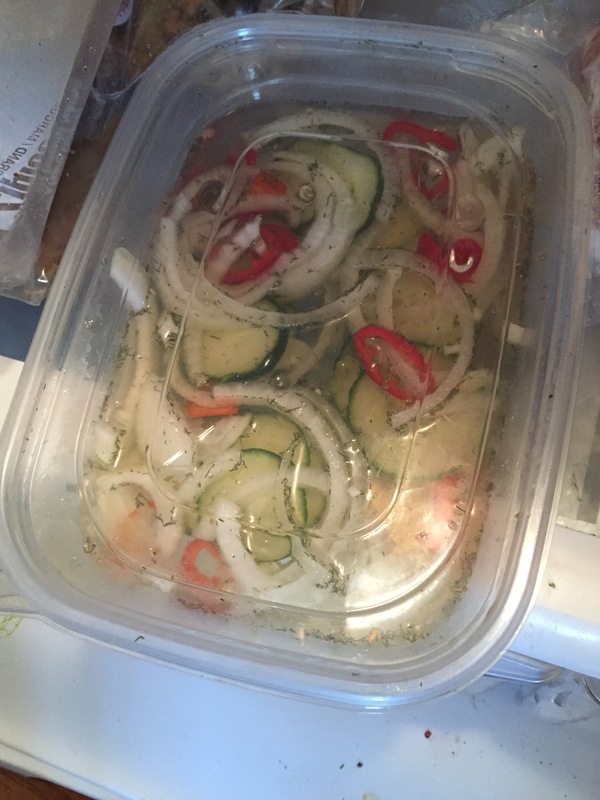 The beauty of this salad is that one can always keep adding slices of cucumbers and onions as they get eaten out of the liquid. 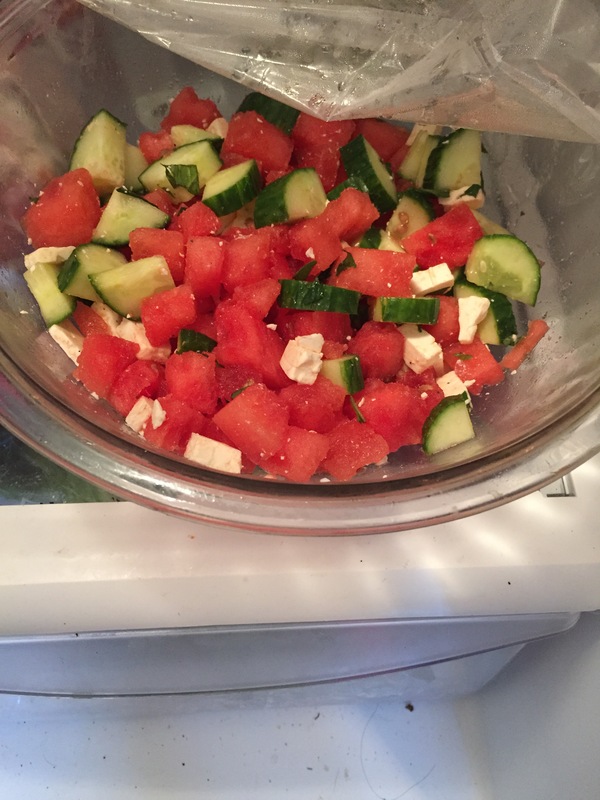 Next I make a cucumber watermelon salad that I try to remember from an advertisement for feta cheese in a magazine last summer. I even bought a mint plant for fresh mint leaves. This is a simple combination of diced watermelon, diced cucumbers, crumbled feta, and mint leaves. I drizzled it with juice from half of a lemon and the lime infused olive oil I purchased from one of those specialty oil and vinegar shoppes while visiting Chatham. But the salad I was looking forward to making was a succotash salad. My inspiration was the salad shown in Food Network Magazine. 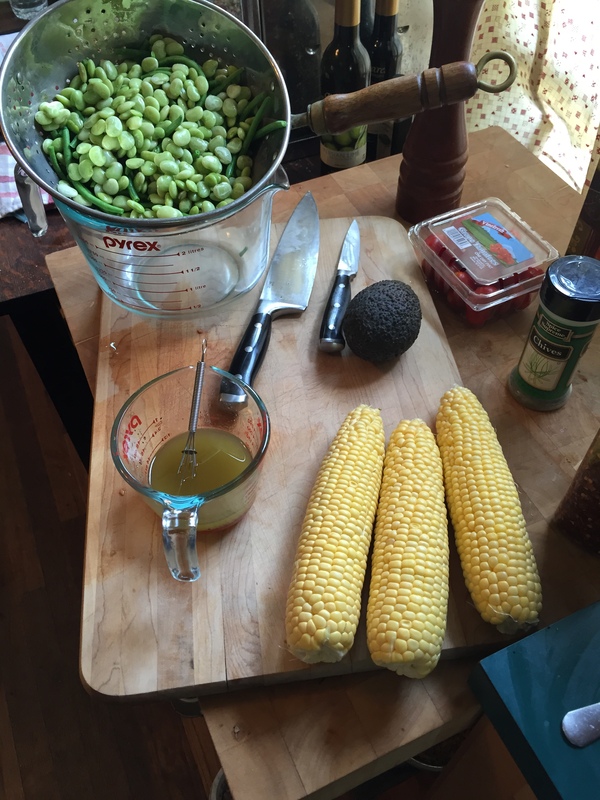 I remember my mom making succotash; she just cooked corn and Lima beans together. I fancy mine up with sauteed onions and bacon. But this is a salad. 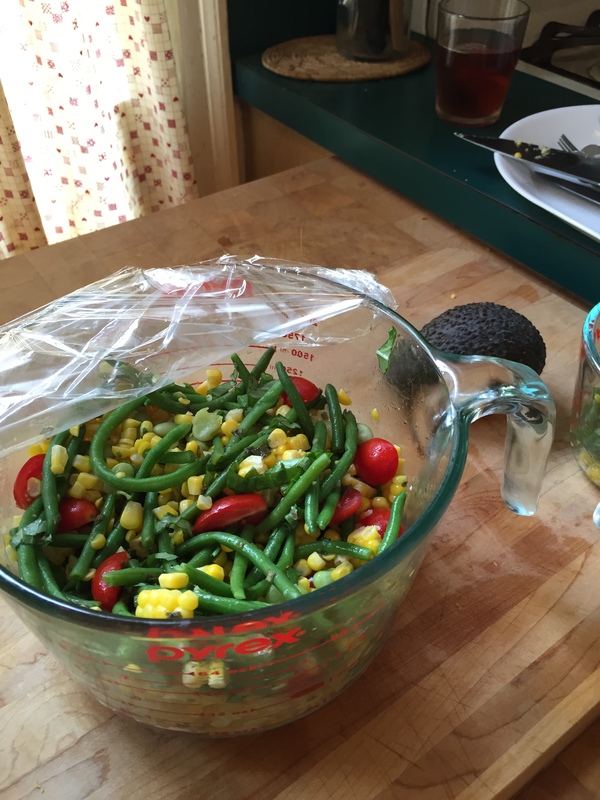 I had made a salad with corn, green beans, and zucchini found in the newspaper earlier this summer. And my darling granddaughter loves to eat green beans and corn so I thought this would be fun to make even though she is not at my home for this meal. I blanched three ears of corn instead of using them raw. I added a sprinkling of red pepper flakes and dried chives, because I had no red onion, and I do not always like onions in salads. (The cuke-onion salad above is a primary exception). The dressing was honey, red wine vinegar, and olive oil. I later drizzled the lime olive oil for a brighter taste. 3 ears corn, blanch, and remove kernels; about two cups each frozen or fresh green beans and Lima beans, thaw and cook in boiling water for about 3 minutes; 1/2 pint grape tomatoes, halved; one diced avocado; a handful of fresh basil leaves,sliced. Mix all together and pour on dressing and toss to coat. I think you can use whatever homemade vinaigrette type dressing you prefer, about 1/2 cup. And add freshly ground pepper and a pinch of salt (if you use added salt). For using the leftovers I added diced ham for a second meal. Keep cool and eat your vegetables! First of all let me correct the sugar content on the cheesecake recipe on the previous post. It is one cup not two cups. I was in my kitchen with all the ingredients nicely at room temperature but that sugar amount was nagging at the back of my mind. This sent me scurrying to hunt for the original clipping. I found it in the third notebook in which I have collected clippings and printouts of recipes over the years. So I made the cheesecake batter and sprayed my mini muffin pans with cooking spray. This was 24 and there was still enough batter to make a whole cheesecake as well. I did substitute Hershey Special Dark chocolate for the German chocolate since the discount grocery store I shop at did not carry German chocolate. I think that a milk chocolate bar could be used for a slightly milder flavor. 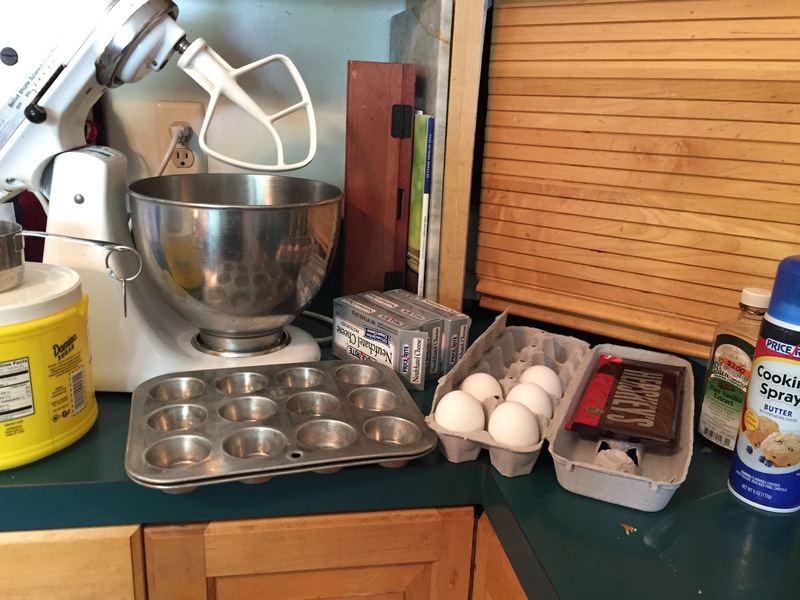 The mini-muffins took 30 minutes to bake. Then I was faced with how to remove them from the pans. I found a spoon was the most effective after letting them cool for a few minutes. I have put these in a freezer bag and have been eating the whole cheesecake that I baked in a 5-7 inch casserole dish. It is very creamy. My goal is to have real food ready for assembly for weeknight meals. So now I have a bit of dessert. This recipe could also make two 8 inch round cakes. In the future I will make a whole cheesecake, cut into wedges, wrap each wedge, and throw them in a freezer bag. Less fuss that way. I have been reading the book 100 Days of Real Food by Lisa Leake. I like the basic recipes she has in the back of the book and have made the onion soup mix. I too am a fan of eating more real food and less processed foods. With that goal my husband and I did not buy any crackers or chips this weekend. So what to eat with cheese? I asked him if he wanted me to make crackers. He said “is that possible?” So I pull out Mark Bittman’s How to Cook Everything and make crackers. I used half rye flour (because I had a half cup left in my freezer). They came out crispy and fine. But there is no real reason to make one’s own crackers unless you can’t find crackers at the store with real ingredients in them. I would suggest making them yourselves once for the experience. My son has made homemade cheezits in the past and they were tasty but the amount of work and mess…I am not a whole food purist. This is why there are brownies cooling on my counter made from a Ghiradelli’s box mix. 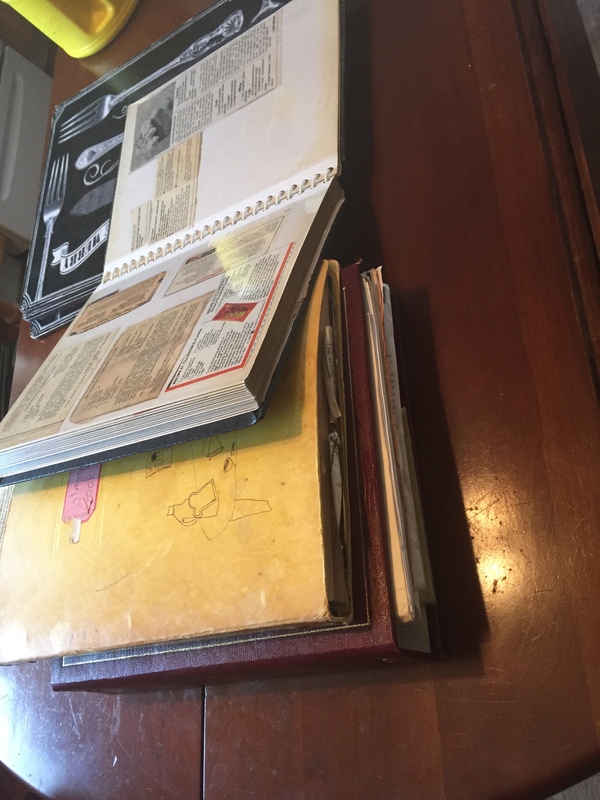 in another post I will tell you about the great brownie search. I needed to clean out the fridge in preparation for a grocery shopping trip and because we had been away camping for the past 4 weekends. Here’s what I found: two half cartons of sour cream, the real stuff without additives, 1/3 jar capers, 1/2 jar horseradish, 1/2 jar mint jelly, a pickle jar with one small pickle in it, wheatgerm, and instant yeast. I had two jars of salsa which had passed their time also. There’s more but this is the stuff that needs to be paid attention to. I am thinking of the baked good to make this weekend. I am thinking of cheese cake bites. I have been reading books and other websites on making things ahead of time and having the homemade food ready to assemble into meals. What has been on my mind does not use the above ingredients. Eons ago I found a crust-less cheesecake recipe in the newspaper. I have memorized the ingredients: 3 pkg cream cheese, 5 eggs, 2 cups sugar, bar of German chocolate, and vanilla extract. 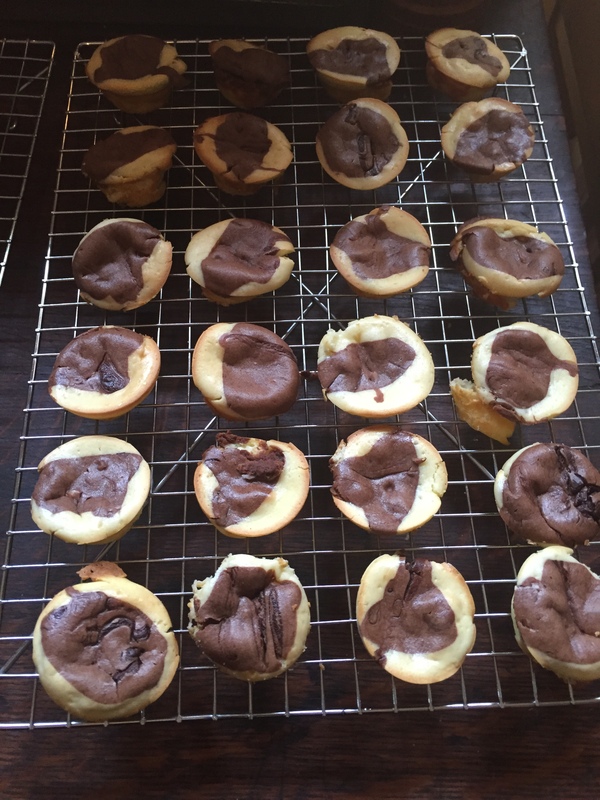 I will bake it in mini muffin pans and when cool plan to pop them into a freezer bag so we can have a little dessert once and awhile without eating the entire cheesecake. I am not a food scientist so I am not sure how long they’ll keep. But it is cheesecake so how long does it need to last? My mom did not ever make a cheesecake to my memory. So when I had my own kitchen as a junior and senior in college I bought the Betty Crocker no-bake cheesecake mix and this is what I made. When I first saw New York style cheesecake I was suspicious. I mean, really, baked cheese! But my palate has matured and I no longer like mediocre cheesecakes or the no-bake type. The cheesecake above is a marbled version. Melt the chocolate and mix into 1/3 of the cheesecake batter made by beating the other four ingredients until creamy and smooth.In a 9 inch buttered dish it takes 30-35 minutes to bake at 350 degrees. I imagine the mini muffin versions will take a shorter time. I will have to let you know after I make them. Gentle reader, please bear with me as I learn the way to blog. I need a blogger class. Usually I can read and learn but on the computer I find I need to see how and then I can learn the process. Well, here I am. I have always wanted to write. I used to write poetry as a child. 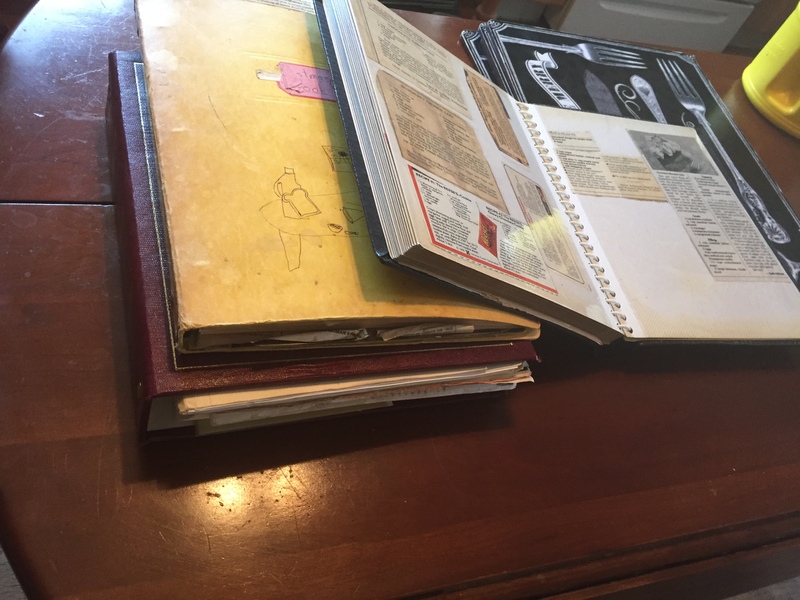 it was full of teen-aged angst.I have been writing my memoirs but no one will be interested until I am very aged and my children may wonder about me, and perhaps say “I never really knew mom.” But this blog is about cooking, reading cookbooks, thinking about food, reminiscing about food, and sharing experiences in food. I am an ordinary cook. I cook for my family and I love to bake and I am learning about whole foods. You are welcome to come along for the journey.